B & H Engineering, P.C. 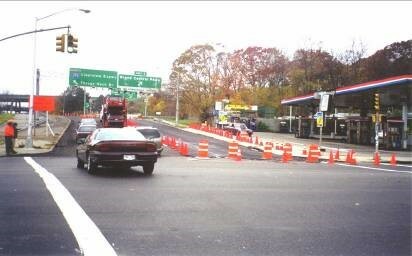 has supplemented New York State Inspection Forces on the construction inspection services, as a prime consultant, for the pavement repairs and microsurfacing of the Clearview Expressway mainline in both north and south directions from Hillside Avenue to the Throgs Neck Bridge. The construction inspection services consisted of providing field inspections; monitoring work zone traffic control, coordination with NYC agencies, TBTA, other contractors and utilities; reviewing contractor's schedule, equipment and staffing; monitoring contractor's EEO requirements; conducting wage rate interviews; processing payments and change orders; and maintaining office records. The work for this project included: clean and fill joints and cracks; remove raised reflectorized pavement markers and repair the pavement; perform pavement repairs on potholes and deteriorated joints; perform milling and replacement of deteriorated asphalt; perform concrete pavement repairs; provide rut filling as needed using microsurfacing Type III; replace thermoplastic pavement markings; and guide rail repair.